Hap and Leonard’s Jim Mickle, interviewed. Michael Kenneth Williams as Leonard Pine. 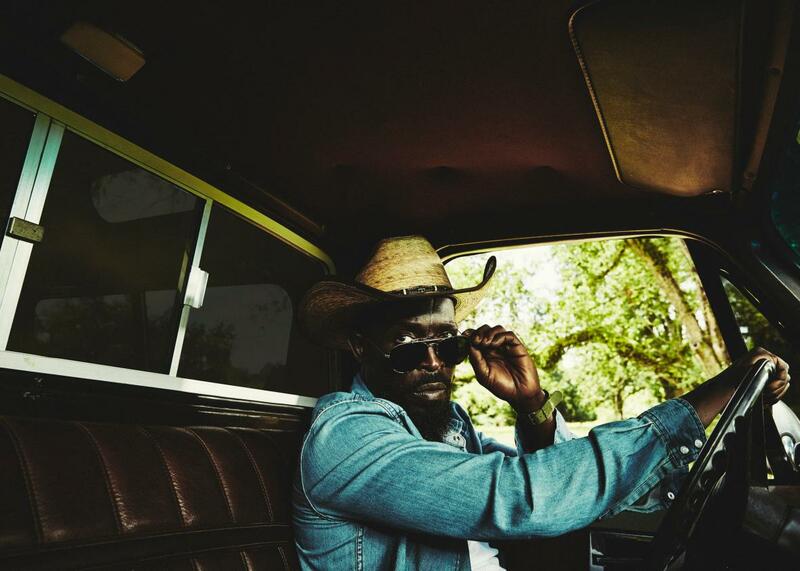 Sundance TV’s new six-part series Hap and Leonard, which premieres Wednesday, March 2 at 10 p.m. is a down-and-dusty “comic swamp noir” set in sweltering East Texas in the late 1980s. The action begins when Hap Collins (James Purefoy) receives a visit from his ex-wife Trudy (Christina Hendricks). All too soon, Hap and his gay best friend Leonard Pine (Michael Kenneth Williams) find themselves deep in gator-infested hot water. I spoke with the show’s creator—and indie movie director—Jim Mickle about the Joe R. Lansdale novels the series is based on, the appeal of making a TV series, and the enduring difficulties of casting gay characters. No. but that is one of the things that make the relationship fresh. Obviously there’ve been a lot of odd-couple relationships, and 48 Hours and all that doing the black and white buddy thing. I think that was one thing that twisted it a little bit. I also liked the casualness of it, and the fact that it’s not always pinpointed. One thing that is frustrating is that Leonard’s gayness doesn’t seem to bring him much pleasure. He has a love scene, but he also hears a lot of hate speech, and it’s hard to find joy in that. It is. I think he’s pretty wounded—all the characters in this are pretty wounded, pretty damaged. They all deal in very different ways. He’s the guy that’s going to go off over just about everything. Next season—what I hope would be the next season—is a much more Leonard-centric season. Naturally, because it starts with him meeting up with his ex-wife, this is a Hap-centered season. I’m really curious about Leonard’s sort-of boyfriend, Raoul. In the books, was he as femme as he is in the TV show? I ask because even now, when there are many more gay characters on television, that type of gay guy just isn’t portrayed very much. Yeah, that’s part of what’s interesting about how Joe writes the characters. He is like, “He’s not a gay character, he’s a character.” But then he is also very open and honest about stereotypes, involving both sexuality and race, so what’s also nice is that he allows those things to exist. Why did you choose to use the N word and the F word? Part of Joe’s thing is frankness, and the fact that it is presented, that it’s not hidden. I think in late ‘80s East Texas that happened a lot, so I just felt it to be authentic. What attracted you to this project? Well, I’m a giant Joe Lansdale fan. I made a movie out of his book Cold in July, but even before then I was a big fan. One of the Hap and Leonard books was one of the first things I read of his—I think The Two-Bear Mambo. It’s genre-bending, really strong characters, really fun dialogue, unexpected twisting stories, that’s what I’ve grown to love about his stuff. Hap and Leonard is that on steroids. You make films, which feels like the apotheosis of your business. Why do you want to be involved in making TV? It can be frustrating to be an independent filmmaker. It can be incredibly rewarding, and I’ve had both sides of that, but I think it’s gotten harder and harder. The business is motivated more and more by fear, and a little bit of safeness. That’s why you’ve seen more people from the independent cinema movement of the ’90s, early 2000s, move into television. I’d be happy making middle-tier movies. If this was 20 years ago, I’d probably thrive and be allowed to do that. But now it’s like that doesn’t exist anymore. If you’re not doing a Marvel movie, you’re doing a million-dollar found-footage movie. Where you’re auditioning for those Marvel movies! Exactly, and I don’t want to do those movies, so I’m really against it. How did Hap and Leonard’s casting come about? Michael was the most obvious choice for Leonard right off the bat—in my pipe dream version of what that could be. He’s played a gay man before, of course: Omar in The Wire. With someone like Michael, who’s known for Omar, it’s fun to let him be funny. It’s fun to let him be Southern. It’s fun to let James Purefoy do a very different thing. It’s fun to let him not be Joe Carol, a crazy serial killer [from The Following]. It was exciting to let people do something that they don’t typically get to do. Is it still hard to cast gay characters? Sadly, yes. We heard early on that Michael wasn’t available, so we did our due diligence and met with a lot of people, and there were a few actors who would not show up for the meetings because the character is gay. In fact, when we cast the young Hap and young Leonard, I remember one kid’s parents wouldn’t bring him to the audition because they looked online and found out that the character grew up to be gay. Isn’t that insane?